The economy of boating has been on a positive trajectory for the past eight years and doesn’t seem to be stalling out yet by the looks of our spring show registrations. The vibe is positive, new boats are being introduced at all recent shows, and propulsion, navigation, steering, and stabilization systems continue to evolve at a rapid rate. These are exciting times to be a part of boat shows and the marine lifestyle, in general. 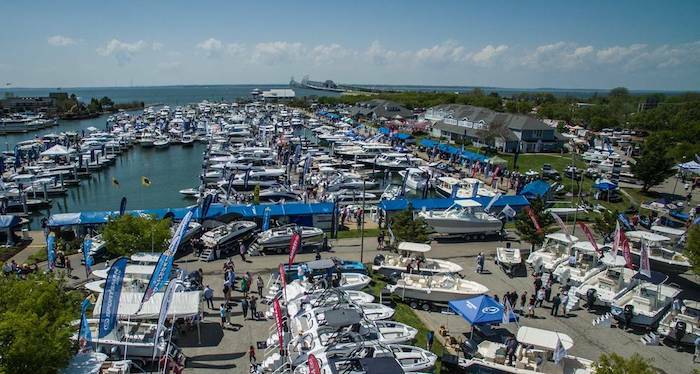 April 12 – 14, 2019 marks the next great boat show opportunity in the Mid-Atlantic. Counting over 30 years as the kick-off to the season of boating, the Bay Bridge Boat Show will once again present the latest in boating gear and accessories plus over 400 boats of every style, size, and color. The new ‘tow boats’ are styled for wake surfing, boarding, and high-performance hauling of myriad water toys. The family express cruiser, pontoon, deck boat, and trailerable weekend boating toys provide fun for all ages and families of many interests. Center console and offshore fishing boats are displayed in large numbers and are powered by a multitude of outboard motors from all manufacturers with your choice of single, double, triple or quad configurations to suit your taste and speed. If your horizons are more distant, new and brokerage options include blue water cruisers, trawlers, flybridge cruisers, and motor yachts up to seventy feet in length. The Bay Bridge Boat Show now features several boating seminars and workshops, entertainment options, the PropTalk Demo Dock to try before you buy, and a new VIP Experience presented by LH Finance. The VIP Experience is designed for those who wish to enjoy boat shows with an enhanced level of service with reserved parking next to the gate, delicious buffets catered by Hemingway’s and all day drink tastings in a relaxed and comfortable area removed from the rest of the show. This experience will provide an unforgettable day at the show. BoatUS Foundation is offering their boating workshops by registering on their web site, or you can relax and enjoy a cocktail at the many beverage stations, the food court, or the pool bar. Adult fun and even a play area for kids will round out the offerings at this year’s show. A weekend of activity on the Eastern Shore in early April will be beautiful with blossoms in full bloom and motel and hotel options are available just down the road, along with restaurants, brew pubs, and entertainment to suit every taste. We are itching to get out on the water as we know you are, and the Bay Bridge Boat Show kicks it all off a week before Rockfish season, Easter, and the first day of spring. Area marine dealers step out with their best selections and prices. As the sun gets closer, the weather warms, and the flowers burst out, let the boating season begin. We look forward to seeing you starting April 12.